I had been to Québec City years ago in my college days, stopping by for a few hours as we headed northward on a camping trip. It wasn’t much back then, just an old European-looking city of modest interest, making me think there wasn’t a lot of things to see in Quebec City. When I returned not long ago with those hazy vestiges still intact, I couldn’t believe my eyes. That tired old town was now a magnificent Old World city that looked as if it had been cleaved right from the French countryside. Fortified walls surrounded it, mansard roofs poked up everywhere, and little cobbled lanes tumbled down to the banks of the St. Lawrence River. 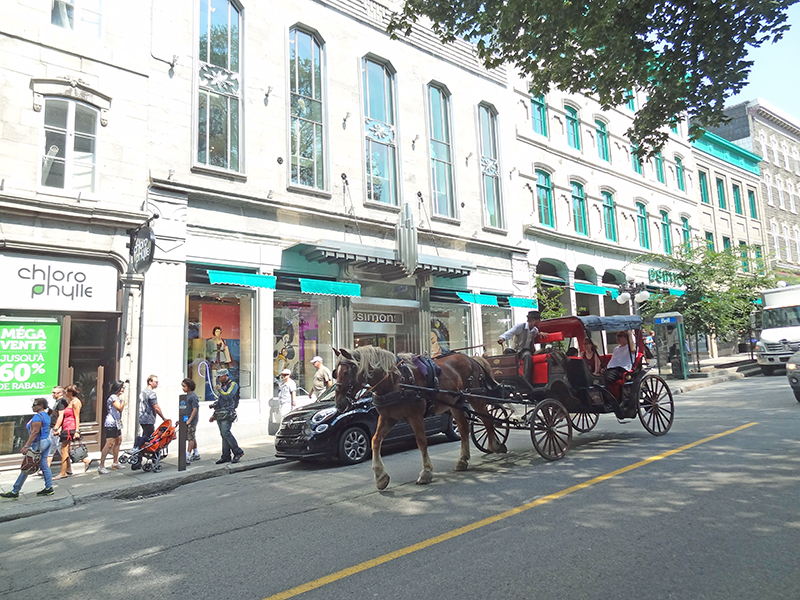 I found there was plenty of things to see in Quebec City, and an abundance of hotels in Old Quebec City. I was quickly drawn in. I arrived at my Old Quebec City hotel in the evening (although considered a hotel in Old Quebec City, it was actually outside the city walls, only a very short walk to the gate). The next morning wasted no time in walking over to nearby Saint Jean’s Gate for a walk down rue St. Jean. Lampposts, as well as many of restaurants and pubs along the way, were all festooned with baskets of flowers, and although it was not yet 8:30am, too early for any shops to be open, there were already little gaggles of tourists wandering all about. Most, as would be expected, had cameras in hand, and were marveling at the beauty of it all and, likely as was I, their luck in finding themselves in such a place. I stopped in a small shop for coffee and, despite the “French-ness” that enveloped me, was immediately reminded of where I was when I tasted the maple-syrup and almond-paste filling in my croissant. 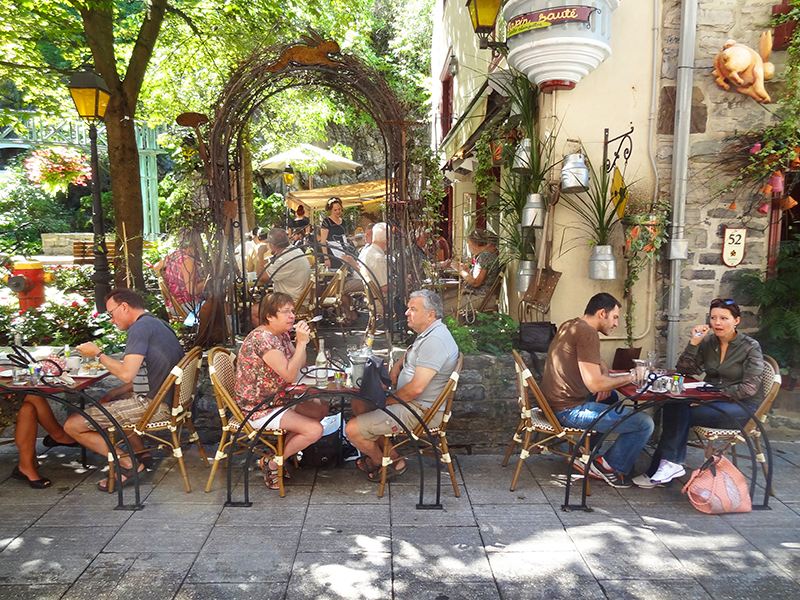 I returned later in the day to delve deeper down St. Jean and after 10 minutes or so came upon rue Ste. Anne a pretty little street that ran alongside the Musée des Ursulines. 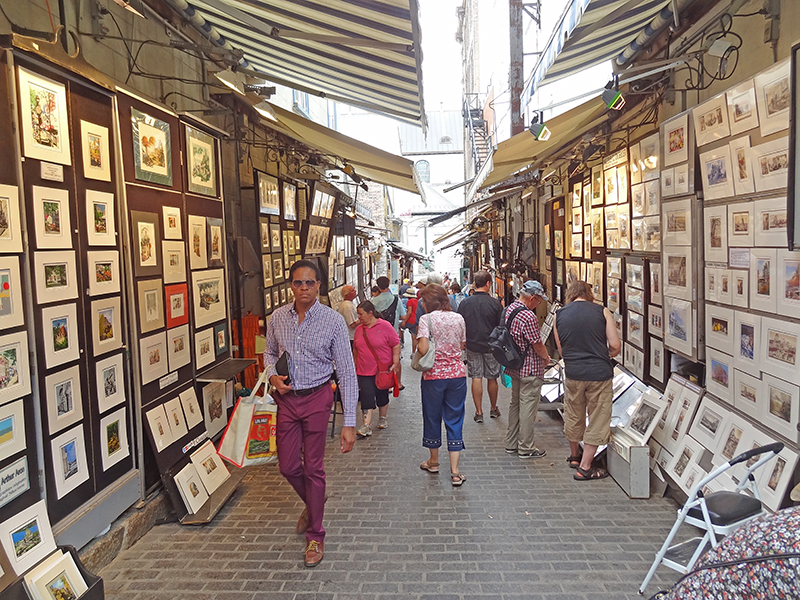 The little lane, with cafés lining one side and artists (several surprisingly good) and street musicians the other, looked as if it had been plucked right off a Maurice Chevalier movie set. Just a block down past the tourist office on Ste. Anne I found myself across from the Chateau Frontenac, the hotel that for many is the symbol of the city. I walked around the side of the hotel and found myself on the Terrasse Dufferin, a wide boardwalk with beautiful views of the river and distant mountains, which connects the area below Frontenac with La Citadelle (still a working military garrison and home to the famous 22nd Regiment) and the Plains of Abraham. Two mornings later with a small group I stood on the Plains of Abraham with Steeve Gaudreault, a historical tour guide par excellence, who shepherded our small group about for a tour of Quebec City. Standing on a promenade above the river we all listened to his fascinating insights about the history of the city, the St. Lawrence and the founding of Québec and learned, among other things, that name of the plains did not have a Biblical connotation but referred to Abraham Martin, a farmer in the area who used to graze his cattle there. The whole area, including the nearby Joan of Arc Garden was federal land known as Battlefield Park. Steeve soon whisked us off to the garden, a beautiful park on the periphery of the battlefield where an annual art show was taking place. In the middle of the little neighborhood park stood a statue Joan of Arc, a smaller replica of the famous sculpture in France, which was commissioned by two American women who donated it to the city of Québec. To be politically correct in this dual-cultured nation, the Canadians placed the statue of the French heroine in an English-style garden. 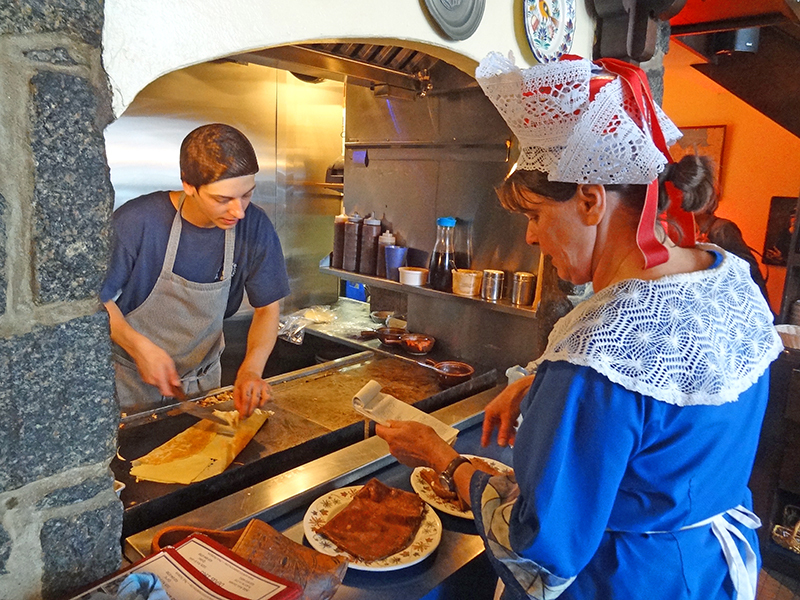 I soon began to realize there were more interesting things to do in Quebec City than I had imagined, as Steeve brought history alive. 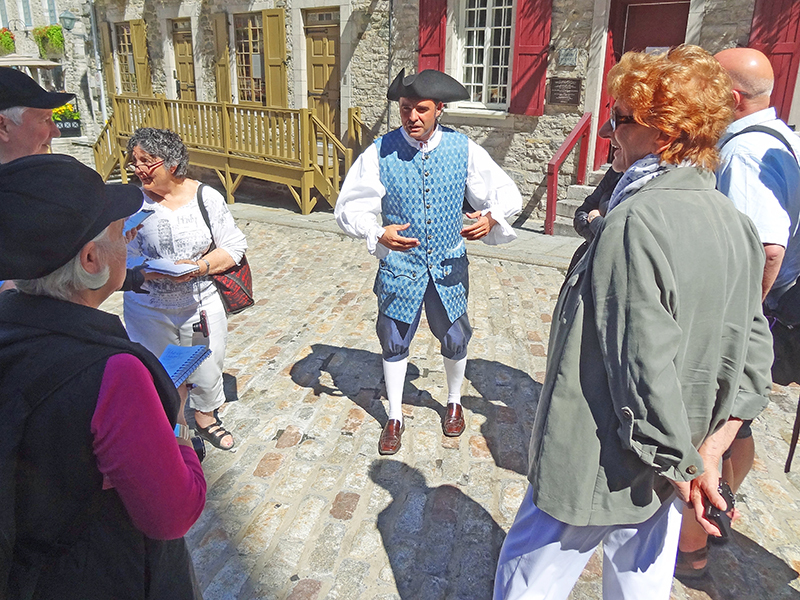 Dressed in the costume of one of the original settlers of Québec, he led us around Vieux Québec, the Old City, and Vieux Port on the river, melding history with the life of his character. He captivated us with his repertoire and knowledge of Canadian and American history and I later learned that he’s also given tours in Boston and New York. 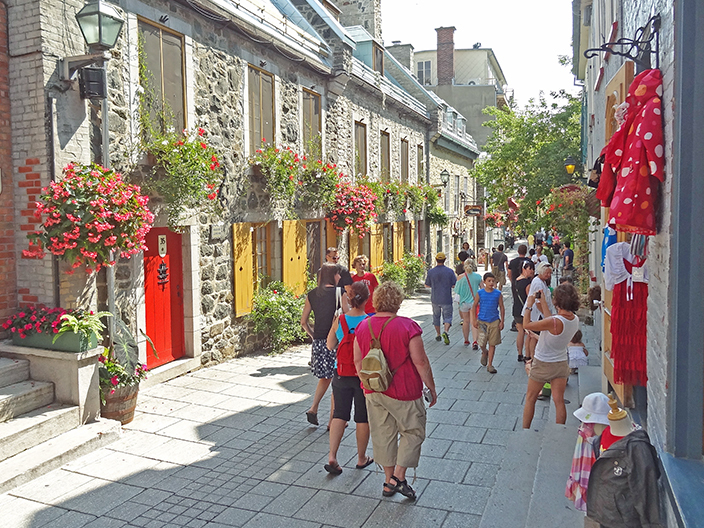 Coming down to the bottom of the old Québec city, we wandered through a wonderful jumble of cobblestone streets, chockablock full of little shops, cafés and restaurants, all a riot of color in the summer sun. 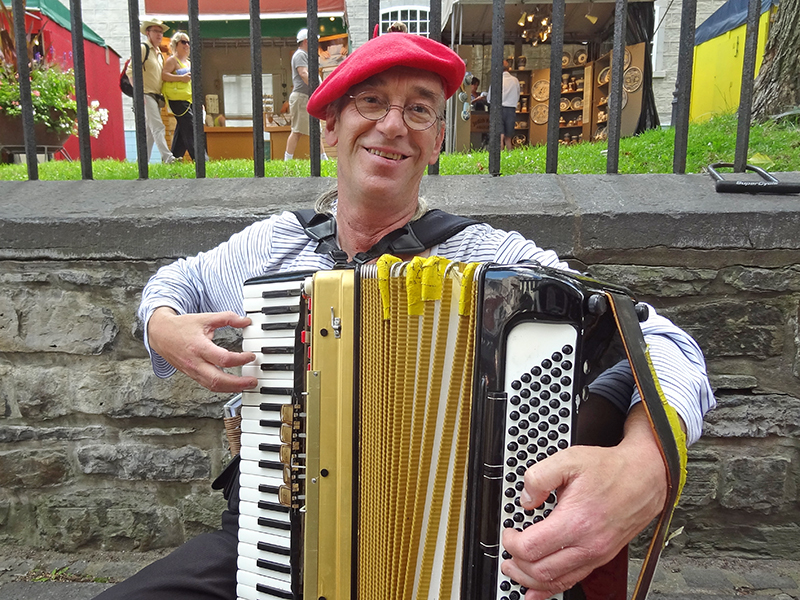 On his tour of Quebec City, Steeve took us down his “favorite street,” rue du Petit-Champlain, which I had visited the previous day and which had already become my “favorite.” The charming rue looked like another Hollywood creation, a little cobbled lane filled with restaurants and shops. Halfway along it was a tiny park where the day before I had watched a violinist perfume the air with his sweet music. 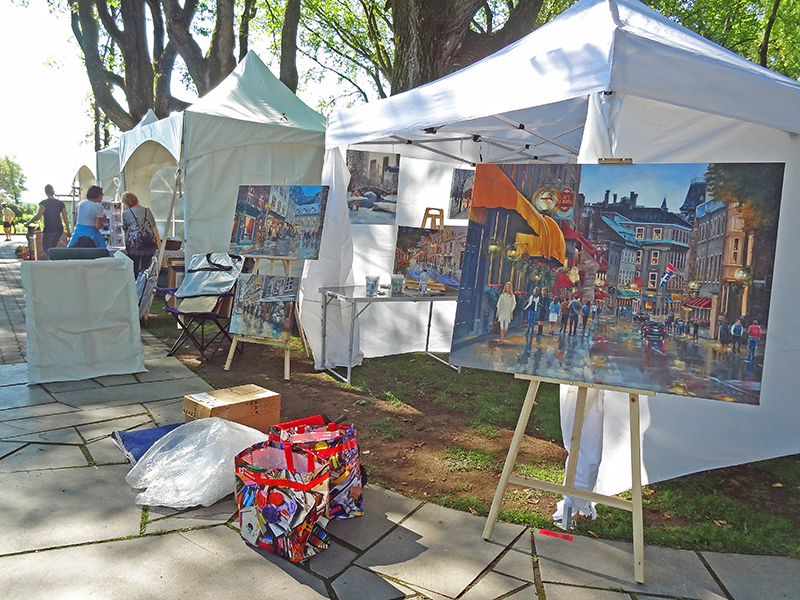 Rue du Petit-Champlain begins in the old port area at Place Royale, the historic birthplace of French Canada. 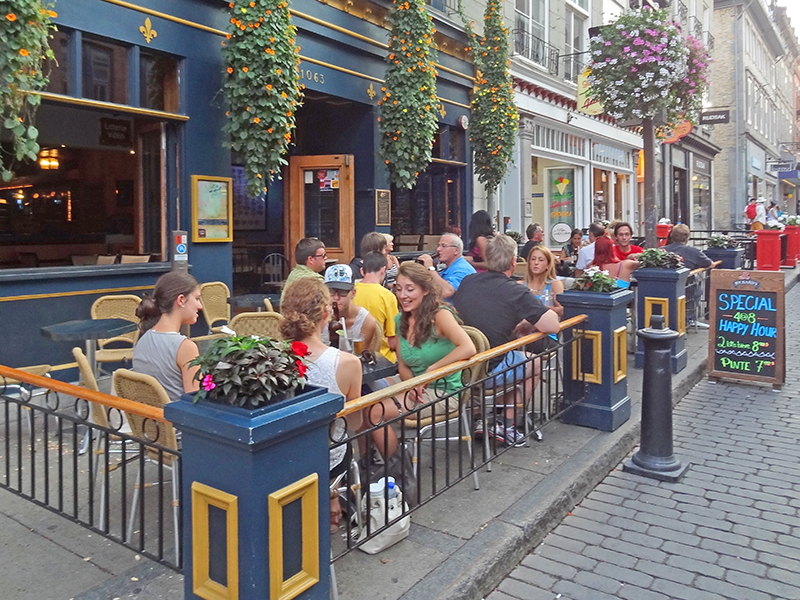 It’s an incredibly beautiful street, one you don’t want to miss if you visit Québec City. Also of exceptional beauty is the Québec Parliament building, one of the most handsome in Canada or even in the world. It’s a beautiful building, stately yet welcoming, patterned after the Louvre in Paris. Located midway between Rue Dauphine Gate and St. Louis Gate, it has a picturesque fountain in a roundabout in front, with beautiful flower gardens. Nearby are huge red planters, about four feet tall and about the same across, in the shape of flowerpots, which personalizes the space and makes it a bit whimsical, as well. There are signs in front of the building giving an explanation of the gardens but, unfortunately, as seems to be the case all over Québec City, the signs are only in French, not in French and English as elsewhere in Canada. It’s a shame since it doesn’t allow everyone on a tour of Quebec City to enjoy this spectacular city to the fullest. As I wandered around the area by Parliament and the battlefields on a cool Saturday morning with the bright sun warming my face, I thought what an international treasure Québec City is, a piece of old France transplanted to the New World, the only walled city north of the Rio Grande. I had already walked about it for several days but at that moment couldn’t help but wish I could stay longer and saunter about it still another time. The most famous of the Old Quebec City hotels is the 5-star Fairmont Le Château Frontenac, which is inside the walls of Old Quebec. It is one of the most celebrated hotels in Canada, with the rates to confirm its status. In Old Quebec City, however, you can’t beat its location. 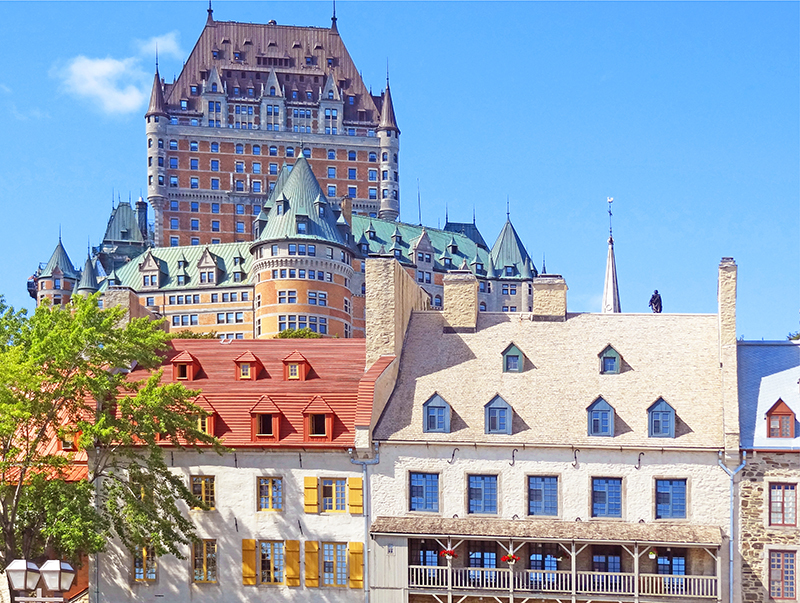 There are nearly four-dozen other hotels in Old Quebec City, including some B&Bs. 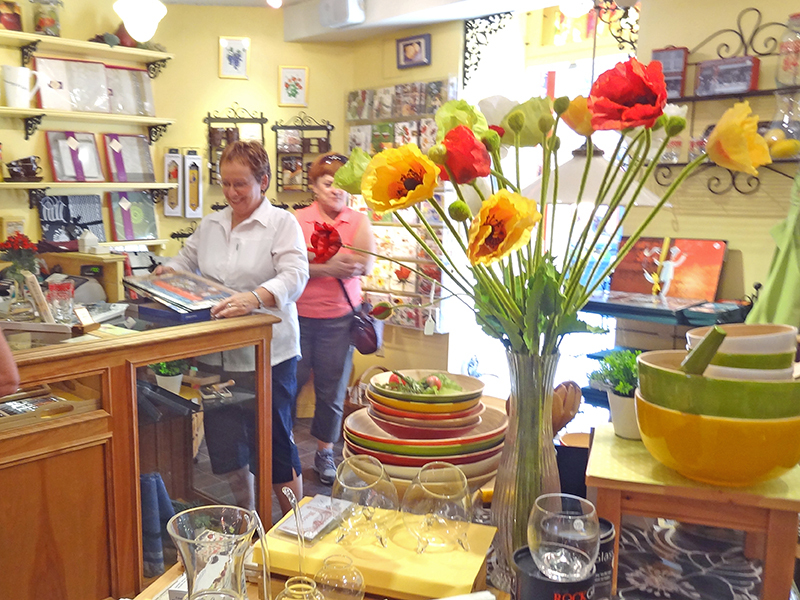 They range from one- to three-stars, providing a good selection. For a good overview of Old Quebec City hotels go to the accommodations section of the Quebec tourist office’s website to view a breakdown of the different hotels. 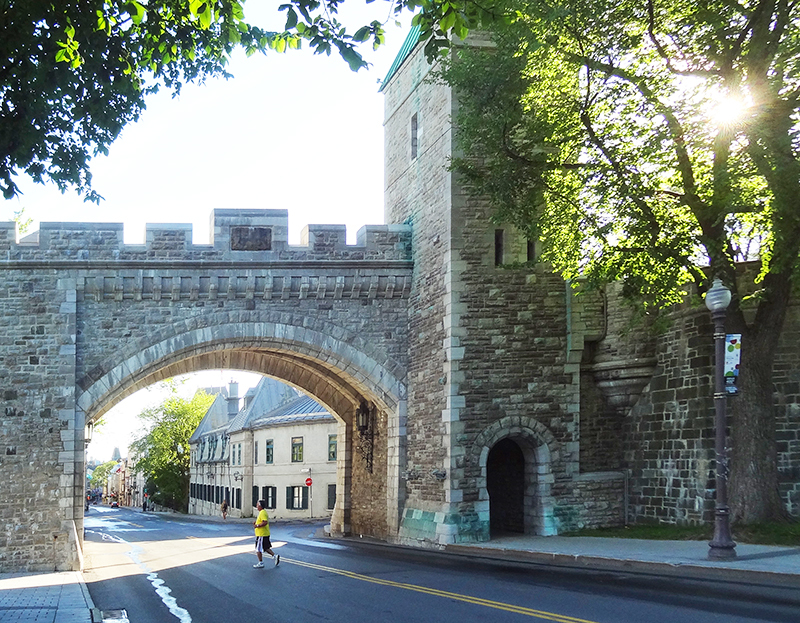 If you’re brand loyal, just a few minutes walk from one of the gates of Old Quebec City, there’s both a Hilton and a Marriott near the Parliament Building. What an excellent feature. As someone who has recently been to this great city it captures the essence of Quebec. Reading this feature in a London coffee shop, it brought back a whole host of wonderful memories of my own visit, and has encouraged me to add the city to my ‘must go back again’ list. Thank you Ashley. It is a great city and sometime I’ll also be headed back there, this time with my wife and some friends. Nice article ! Reading this helps me remember how lucky I am to live here 😉 Every day, I get to love this City more and more. Québec is such a great place to visit or to live in ! You are very lucky Mélissa. Québec is an incredibly beautiful city! Jim, You probably don’t remember, but you and I stopped there back in 1976 when I accompanied you on the cross-country trip! I remember it well because of the number of “pinches” I received while walking through the city. But, my husband and I were there just last week as the final stop on our cruise. We participated in a 3 hour history bike tour with Cyclo Services and were lucky enough to have the guide to ourselves! Would definitely recommend this company. The bikes were great and they gave us a snack too! Glad you enjoyed your recent visit.